Attract pollinators with gorgeous blooms atop towering stems. 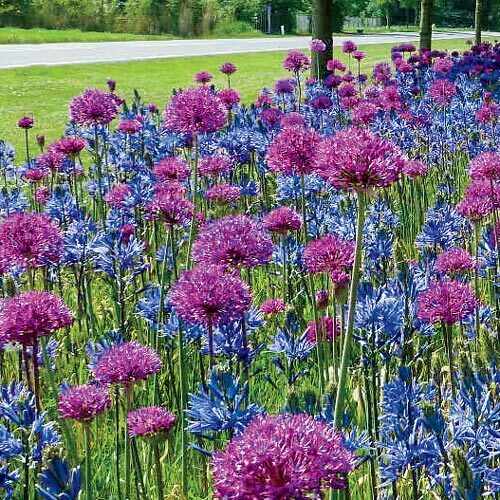 Equal parts Allium 'Purple Sensation' and Camassia 'Caerulea' combine to create a long-blooming blend in dazzling shades of purple. The varieties bloom together on tall, stately stems that keep their flowers highly visible— which is especially exciting for beneficial pollinators in your neighbourhood! In fact, this duet is a magnet for bees, butterflies and other pollinators. Does well in clay soil. Plant mixture with Daffodils for Naturalizing or Yellow Trumpet Daffodils for an even longer blooming time.